Let me introduce you to Antelope Canyon. I’m totally captivated by these wonderful photos. The canyons are without doubt one of the most beautiful wonders of the world. I had fun arranging these images into an order, the top few are more shadowed, having less light filtering in than the last. They are all exquisite. Enjoy. Antelope Canyon is located near Page, Arizona, on Navayo, native American tribal land. Antelope Canyon consists of two photogenic slot canyon sections, Upper Antelope Canyon or The Crack; and Lower Antelope Canyon or The Corkscrew. The Navajo call Upper Antelope Canyon Tsé bighánílíní, which means “the place where water runs through rocks.” Lower Antelope Canyon is called Hazdistazí (“Hasdestwazi”) by the Navajo Parks and Recreation Department), or “spiral rock arches.” Of the two canyons Upper Antelope canyon is the most frequently visited by tourists. This is because its entrance and entire length are situated at ground level, requiring no climbing. Thank goodness! 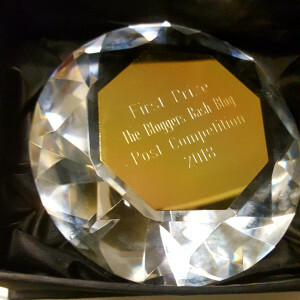 Like the sound of that! Also, direct beams of sunlight from the openings in the top of the canyon are much more common in the Upper than in Lower canyon. In the summer months these beams occur most often, as the sun is high in the sky. Winter colors tend to be a little more muted. 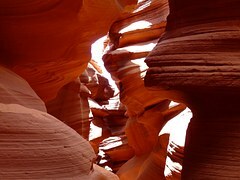 Lower Antelope Canyon is more difficult to visit. Before metal stairways where installed visiting the canyon meant that you had to climb along pre-installed ladders in certain areas. Even after the stairways were installed, it is more difficult to access Upper Antelope as it is longer, narrower in places, and footing is not available in all areas. Not for the faint-hearted or your granny! Also to leave the canyon, the climb out requires several flights of stairs. So for those who enjoy climbing this sounds the one to visit! Despite this Lower Antelope Canyon is still a challenge that many photographers can’t resist, and no wonder as the views are breath-taking. Photography within the canyons is no easy feat due to the wide exposure range (often 10 EV or more) made by light reflecting off the canyon walls. Antelope Canyon is a true photographers dream. Many are attracted to come see this wonder of the world. It has been a source of tourism for the Navajo Nation. Since 1997 it has been possible to access the canyons by tour. The Navajo tribe must be so proud of its status now as the Navajo Tribal Park. 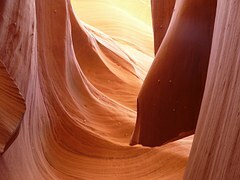 Well, I’m so glad that I found Antelope Canyon and made it my Friday image. It really makes you realise how wonderful the world is. What a lovely thought to start the weekend with! Have a fabulous weekend. This entry was posted in Friday, Fun, Images, Inspiring Images and tagged Antelope Canyon, Arizona, Friday image, Navayo Tribe, Photography. Bookmark the permalink.